Much has been written about the Grey Nuns  and the Franciscan Nuns  in our history books but little about the Sisters of Our Lady of the Missions and their role in education within this province. * Denotes French speaking communities. It can be seen from the aforementioned data that the Sisters did most of their work in rural areas. A brief description of each community will serve to enlighten the reader about the many trials and tribulations the Sisters had to confront. Ste. Rose-du-Lac is a little town situated about 180 miles north-west of Winnipeg. The convent there was among the first foundations made in Canada. The first settlers to arrive in Ste. Rose were people from St. Vital, near Winnipeg. These were soon followed by colonists from France and Belgium who came to make their homes in this distant part of the prairies of Manitoba. Oblate Missionaries visited this growing Catholic settlement and offered Holy Mass in one of the homes. In 1895 Reverend father Leqoc, O.M.I. became Parish Priest of Ste. Rose and immediately he set about providing a school for the children of the district. In 1899 Reverend Father was returning from Europe, when, on the ship, he met some of our Sisters who were destined for our first Canadian missions. Reverend Father wrote to Reverend Mother Marie du Saint Rosaire, Superior General, and in the following year three Sisters under the direction of Reverend Mother M. Imelda were sent to Ste. Rose, to open a convent and school there. The new school was progressing favourably and soon boarders were received at the convent. Towards the end of 1901 Postulants began to arrive and for twenty-two years Ste. Rose was the Novitiate House of the Canadian Province. The Convent in Brandon is now the oldest foundation of Our Lady of the Missions in Canada. It was not the first foundation, however, as the band of pioneer Sisters who went to Canada in 1898 settled in Grande-Clairiere, a French-Canadian village not far from Brandon. The convent of Grande-Clairiere, aptly called “Our Lady of the Snow,” fell a prey to flames in 1923 and was never rebuilt. The town of Brandon situated about 135 miles west of Winnipeg, was only 18 years old when four Sisters of Our Lady of the Missions arrived in 1899 to re-open classes in St. Augustine’s parochial school which had been closed for some years after the withdrawal of the Sisters of the Faithful Companions of Jesus. 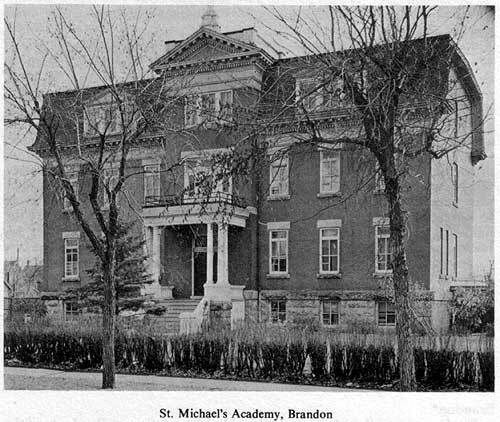 Besides St. Augustine’s parochial school, the Sisters conducted also a flourishing senior day and boarding school in Brandon, known as St. Michael’s Academy. After World War II the enrolment in the Academy increased to the point that every available room had to be used in the house for classes. During the holidays the Sisters go to outlying districts to teach religion. On Sundays they taught catechism at St. Hedwig’s Polish Church in Brandon, and also at Rivers Camp and Shilo Camp. Catholic pupils attending Brandon public schools were collected at St. Michael’s Academy for religious instruction on Sunday morning. Thirty miles due West of Winnipeg and five miles to the North of the Trans-Canada Highway, lies the little French and Metis village of St. Eustache. This hamlet, the centre of a large wheat growing area, had its beginnings in 1885 when early settlers were attracted from the low lying and frequently flooded land of Baie St. Paul and Marquette, four miles away, to the fertile soil and high land on the south bank of the Assiniboine River. Rev. Father Arcade Martin was then in charge of the scattered families. It was he who chose for the new parish and village the name of St. Eustache, Patron of hunters, since the land around abounded in game and his parishioners were devoted to the hunt. The first church of the new parish was soon built of logs and raised on four poles. Later a school was erected and the education of the children began. On 18 October 1901, four Sisters of Our Lady of the Missions arrived in St. Eustache to take charge of the school. Some parishioners still remember the coming of the Sisters and one old gentleman was happy to relate his memoirs to those early days and the humble beginnings of the apostolate of our Sisters among the children in the village of St. Eustache. His memory is still good and he recalled the days of his boyhood when he loved to work around the first small house which served as convent and run messages for the Sisters. In 1904 the new building destined to be henceforth the Sisters’ dwelling place was blessed and opened by the Bishop of Manitoba His Grace Archbishop Langevin. As in Ste. Rose-du-Lac, Elie, Letellier and St. Joseph, the Sisters in St. Eustache have always taught in the local public school. All these villages are French centres where French is spoken in the home. The public schools, however, are under the Government and must follow the programme of Studies set by the Department of Education in English. In order to preserve the French language among French-Canadian people, a special association (Association d’education des Canadiens-Francais du Manitoba) has been founded which sets its own programme of studies, and sends its own Inspectors. Thus the Sisters have a double programme to teach and the schools are known as bilingual schools. The French programme is a subject on the curriculum even of the elementary grades. Many girls from St. Eustache and the surrounding Catholic villages have, over the years, become Sisters of Our Lady of the Missions and many of our first Canadian Sisters have been laid to rest in the cemetery behind the present beautiful parish church. From the community room of the convent can be seen the Cross which marks their last resting place. In 1922 the Novitiate was transferred from Ste. 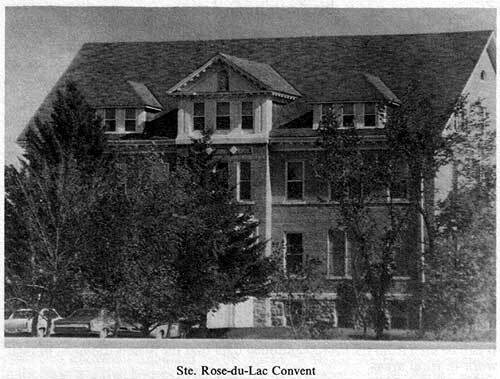 Rose-du-Lac to St. Eustache where it remained until 1926 when the Sacred Heart College, Regina, became the Novitiate House for the province. The township of Elie is situated only six miles from St. Eustache on the Trans-Canada Highway and the Canadian National Railway, and is, therefore, to some degree more a business centre. For many years Elie formed part of the Parish of St. Eustache. In 1904 a small church was erected in Elie but there was no resident Priest until 1907. 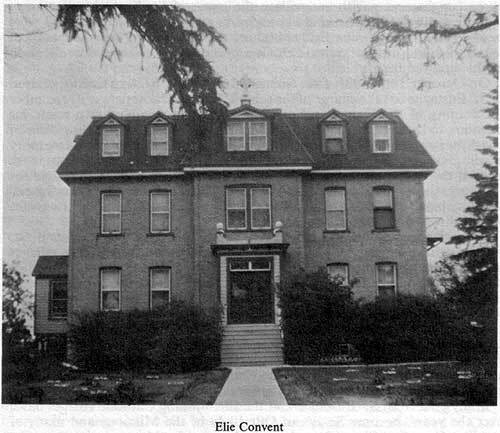 At the reiterated request of Archbishop Langevin, three Sisters were sent in 1905 to take charge of the public school there for the children of the district which had received its name from an early French Settler called Elie ... who, anxious to provide for his children the benefits of education adopted a number of poor children into his already numerous family so as to have the number of pupils required for the establishment of a school. Sometimes during the night the wind would carry off some empty vessels, obliging the Sisters the next day to go out in search of them. Such were some of the incidents, amusing or otherwise, which marked the pioneering days in Elie, and no doubt of many other foundations also. The saddest event, however, in the history of Elie was the complete destruction by fire of the house that had been acquired later as a residence for the Sisters. On New Year’s day 1912, the weather being bitterly cold, the crib in the little chapel caught fire and in a short time, owing to the absence of sufficient water supply, the whole building was burnt to the ground. When the Sisters arrived from St. Eustache, they found the little community of Elie in a neighbouring house, having lost everything, not even possessing a scarf or big sleeves. They took them at once to St. Eustache where the Sisters stayed for a week, after which they returned to the rooms they had formerly occupied in the school building. All the convents of the province came to the help of the sorely tried community and in 1915 the present convent was erected. Not unlike the two Sister convents of St. Eustache and Elie, west of Winnipeg, are the convents of Letellier and St. Joseph, 60 miles due south of the capital city and only about 15 miles from the border of the United States. These convents are situated in the Red River region. From Winnipeg to the American border the highway extends almost in a perfectly straight line through miles of rich grain fields dotted with grain elevators in which the lorry loads of wheat are deposited every year in the month of August to await the arrival of the freight trains which transport the yet unground flour to centres of distributions or to the ports of Canada for shipment to overseas markets. Letellier lies on this highway and on the railroad to the States. St. Joseph is four miles to the west. When the Sisters went to Letellier in 1902 the village, almost entirely Catholic, was 25 years old. It was a flourishing parish and soon the Sisters were not only directing the public school but within a year a convent was built and boarders were admitted. Not less than 30 young girls from Letellier and St. Joseph have become Sisters of Our Lady of the Missions. When the Canadian Houses were erected into two Provinces in 1930, Letellier became the Provincial House of St. Mary’s Province, until 1949 when the Provincialate was transferred to Cite Jacques Cartier, near Montreal. The village of St. Joseph is one of the oldest parishes in Manitoba. It was founded in 1877. Its distance from busy commercial centres has been an important factor in helping its 400 parishioners to retain the lively faith which characterizes them. After the A.M.O.G. community had been established a year in Letellier, the Sisters set out for St. Joseph each Monday morning of the school year to teach there for a week. During this period they occupied the upper storey of the school building. This arrangement lasted for two years after which the Sisters, being urgently needed in Elie, withdrew temporarily. 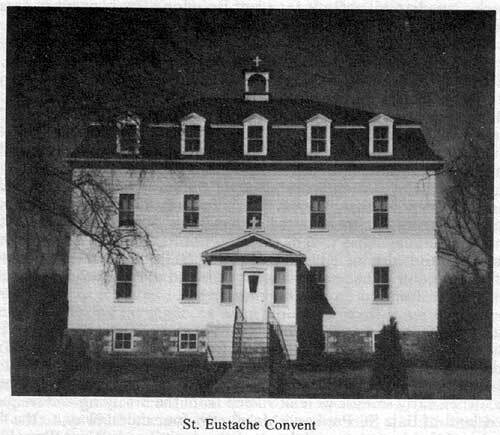 In 1909, however, in response to the persistent appeals of the kind Parish Priest, Reverend Father Arcade Martin, who had been the founder of St. Eustache parish and instrumental in bringing the Sisters to that foundation in 1901, Reverend Mother M. St. Sindonis, Vicar Provincial, obtained permission to purchase a property in St. Joseph, and the Sisters were to resume the work of education in this Catholic district of the Diocese of St. Boniface. As in Letellier so also in St. Joseph the people were kind and generous to the Sisters. Although the population of St. Joseph has not increased greatly over the years, a convent was built in 1923. 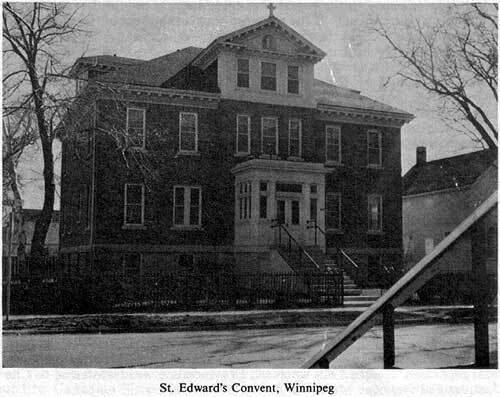 On 5 November 1909 only a week after three Sisters had taken possession of their convent home in St. Joseph, another group of three Sisters arrived in Winnipeg at Archbishop Langevin’s request to open a parochial school in the newly erected parish of St. Edward’s in the western limits of the city. As in the beginnings of so many of other foundations, so also here the Sisters lodged during the first few years in the school building itself. Three days after their arrival the school was opened with forty pupils in Grades 1 to 4. A month later His Grace Archbishop Langevin came to bless the school. In the following year one more Sister came to join the little community and Grades 5 and 6 were commenced. Five years later in 1915, a fourth class was added. 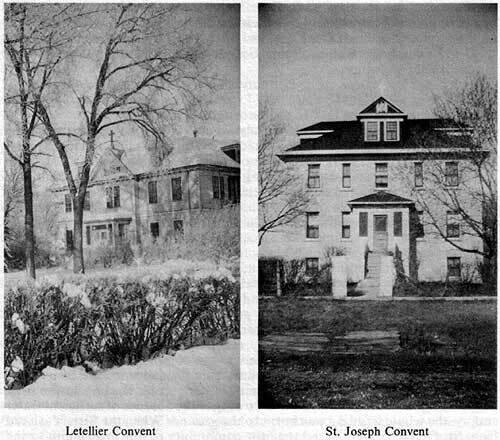 In 1923 the convent was built and four new classrooms were added to the school building. Besides the work of education the Sisters have the opportunity of doing other apostolic work and works of mercy in this large city of Winnipeg. On Saturdays and Sundays they taught religion to children attending non-Catholic schools. The Sisters visit the sick in their homes and in the hospitals. Formerly music students who had completed their festival would then entertain the inmates of Homes for the Blind and hospitals for crippled children. The Eucharistic Crusade was another form of apostolate conducted by the Sisters among their pupils. Volunteer members carried on their meetings and discussions themselves, the Sisters being there only to supervise these gatherings of zealous young pupils whose attendance at week day Mass had greatly improved as a result of this Catholic Action effort. When the two provinces were amalgamated in 1956, St. Edward’s convent, being centrally situated, became the Provincial House. It has always been the ’House of hospitality’, for when the Sisters from the country centres come to the city on business, for school meetings and study courses, etc. St. Edward’s convent although not very large, has always offered them a warm welcome. 1. See Mere D’Youville by Albertine Ferland Angus of the Montreal Historical Society - Beauchemin, 1945. 2. See St. Laurent, Manitoba by Sr. Pauline Mercier F.M.M. - White Horse Plains S.D. #20 publishers, 1974. 3. Jubilee D’or - Canada - Congregation de Notre Dame des Missions - pg. 10-11. 4. See Teaching Nations for 100 Hundred Years. A record of the work and growth of the Congregation of Our Lady of the Missions, 1961. Also Unswerving Journey by C. Couturier S.J., 1965. * Edited versions taken from: Brief Historical Account of the Convents of Our Lady of the Missions in Canada, 1961.